Calories: 150 calories (estimate) in 1 oz. 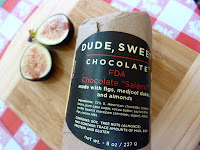 Today was Day #4 of Chocolate and Fig Theme Week. This chocolate and fig salami from Dude Sweet Chocolate (Dallas, TX) arrived just in time for a summer picnic. Slice this salami and serve it up with meat, cheese or sherry and you'll up the creative quotient at your table, inside or out. 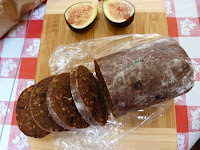 Made with 72% South American chocolate, California marzipan (almonds, sugar), dates, dried figs, and cocoa nibs, this cleverly disguised treat looked (and had a bit of the texture) of a salami, but was very rich, dense and satisfying, due in large part to the dates and figs. However, the blend of nibs and marzipan with the chocolate was also just right, and not too sweet. Brava to chef Katherine Clapner.